Farheen Zehra graduated in 2003 with a major in marketing from a leading business school of Karachi. After graduation she worked in the corporate sector for a few years but soon became disenchanted of it all and started teaching. 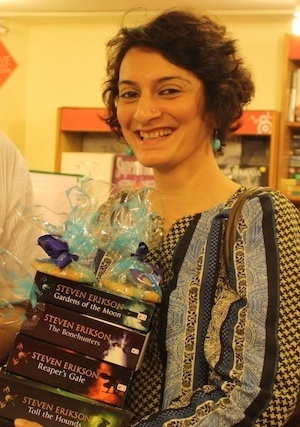 She joined Desi Writers’ Lounge in early 2013 and is responsible for managing offline activities, primarily in Karachi. Acting is her secret passion and she has acted alongside her husband, a professional theatre actor, in the National Academy of Performing Arts (NAPA) Repertory production of A Midsummer Night’s Dream in 2011. She was also a part of the first NAPA Theatre Festival in 2012 where she again acted with her husband in Dr. Enver Sajjad’s play, Koel. She was one of the participants who completed the first DWL Short Story Workshop in 2013. A writer by choice, she is currently working on turning her synopsis into complete pieces of fiction.